Experienced and Certified, a Winning Combination! IP Office R9.0 SP2 available NOW! 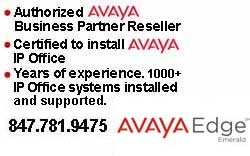 Avaya Ethernet Routing Switch 3500 Series - Perfect fit with IP Office! Experienced and Certified - a winning combination! Circuits can take 30-45 days to get installed. Often the cabling is abandoned and even cut out. Are jack locations where you need them or adequate? Consider offers for voice and data service. Is it time to invest in building a solid network for voice and data? Ready for move in date and cutover. We partner with a company that can evaluate your phone and internet circuits. They can provide a side by side comparison of your current bill vs your new savings. They can consult with you on just a few lines or multiple locations connecting your voice and data traffic. Avaya, Lucent, AT&T, IP Office, Definity, Partner, Merlin, Magix, Intuity and Audix are registered trademarks of Avaya, Lucent Technologies, and AT&T.